I really enjoyed this book. 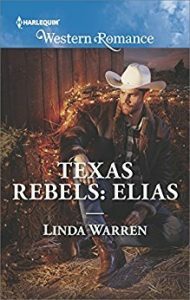 I’m disappointed that I didn’t find the Texas Rebels series by Linda Warren sooner. This is the seventh and last book in the series. I am going to have to go back and read the rest of the stories because I have a feeling I’m going to enjoy them based on how much I enjoyed reading this one. I really need to point out that this story was a heartwarming romance about second chances. The heroine, Maribel, was written in a way that she could very possibly be me or someone I know. She has realistic issues that I can’t get into but I genuinely could understand from a personal perspective. In fact the advice she was given had a direct impact on me. Therefore I can consider this book to be inspirational. I quote, “You may not understand that kind of love, but sometimes people love the way they can”. That statement spoke to me and was powerful and meaningful to the plot. I admired Maribel for her courage and vulnerability as well as her ability to forgive. I really connected with Elias, the hero, because he shared my values in a relationship. Elias and I both need vows of love to be shared at some point in the relationship. However, Maribel shared my values as far as needing to see love through actions not just with the words “I love you”. Together they demonstrated true love. I respected how Maribel and Elias were direct and honest with each other. No mind games. When I read a romance book I want to be able to rave about it. I am so excited to be able to do just that. Everything was remarkable. The writing style, the plot, the characters, the pace, and the originality all had me captured from the start to the end. While this story was the ending in the series, fortunately for me it was my beginning. I will get to go back and meet all of the characters in the Rebel and McCray families that I briefly got to know and fall in love with in Texas Rebels: Elias. I am quite thankful that I stumbled upon this book and I can definitely recommend it. Texas Rebels: Elias was an extremely enjoyable read for me. Just be prepared to “expect the unexpected”. This novel is more than meets the eye.